It’s time to face the facts: we’re getting to that age where wearing whatever you wore to school, presumably dirty jeans with rips along the hem, and your favorite hoodie or t-shirt, to an after-school job interview is considered unacceptable and tacky. With summer quickly approaching, the respectable jobs are beginning to get snatched up by your fellow classmates, friends and roommates, and while you’re happy for them, you too want in on the secret to landing a great summer gig. Aside from having a killer resume that landed you the interview, you’re going to have to dress the part to prove that you’re more than just a piece of paper. Ladies, I am not saying to put all your goods out on display, despite what any Katherine Heigl movie has told us. Gentlemen, I am not telling you it’s time to whip out your dad’s old powder blue three-piece. 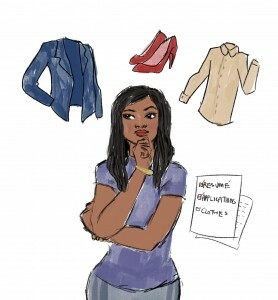 This “how-to” will not only tell you how to look the part, but also how to be the part and take the work force by storm. It’s 2014 and that means old school traditions are out and people are all about embracing the new. This means that what your mother is insisting you wear to your interview may not always be the right choice. For starters, it all depends on the type of establishment you are seeking work in. If your upcoming interview is at Gymboree, then you are not expected to show up wearing a tailored Ralph Lauren pantsuit. Use your discretion and be the judge of what you think is acceptable to wear to a casual place of work. Ladies, a casual interview would be the perfect place to wear a cotton blazer with a pair of harem pants and a comfortable blouse underneath. If you’re seeking work in a corporate atmosphere, such as a bank or a business establishment, it is a good idea to consider something a little more professional. “Dress pants, maybe a button-down top. A decent length skirt if its warm out,” said Brittany Curran, who worked for Annual Giving as a student caller, a role that demanded she be dressed professionally. For men, try a dress shirt and classic tie, paired with dress pants and a simple brown or black shoe. By wearing something simple yet professional, it separates you from the frat boy in distressed jeans whose interview was just before yours, while also making it look like you know a thing or two about fashion. Coming from my own personal experience as someone who had the opportunity to work in a corporate atmosphere at RBC last summer, I found that having a few staple pieces in your wardrobe such as a blazer, pencil skirt and simple black heels never hurts. With that being said, don’t be afraid to have fun. Your unique style should still be able to show through in what you’re wearing to interviews or the workplace. After all it will be your personality that will get you the job. Stay professional, act the part, most importantly, have fun and good luck.